Sometimes, the toughest stains just won’t budge no matter how many times you try to wash them. So to ensure the best clean for your clothes use a pre-soak to show that grime who’s boss! 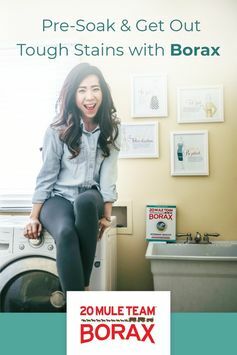 For most normal wear, a normal laundry cycle with Borax as a laundry booster is plenty to get your clothes looking and feeling clean again. But when your clothes are stained, a wash cycle is often not enough. Pre-soaking a stain allows the soap (or in this case, Borax) to slowly break down the stain. Followed by a normal wash cycle, a simple pre-soak with Borax can help remove a fair number of stains. One of the best things about pre-soaking is that you can use it on a single garment or a whole load of laundry. Just adjust the amount of water and Borax, as needed. To make the pre-soak as effective as possible, rinse your stained clothes in warm water first. Using warm water helps the Borax dissolve the stains more easily. 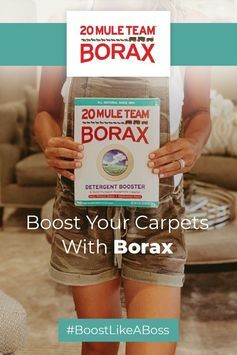 Just remember that the more clothes and the more water you use, the more Borax you’ll need to add. Add ½ cup of Borax for every gallon of water that you used to fill the bucket. Stir the water gently to dissolve the Borax into the water. Add your clothes to the bucket, making sure that they are submerged in the water. You want the whole garment to be wet with the Borax and water mixture. Leave the laundry items to soak for about 30 minutes in the solution. For tougher stains, soak for 45 minutes to an hour. Once the clothes have soaked, take them out and wash them as you normally would and follow the care instructions on each garment’s label. Before putting your clothes into the dryer, check each garment to ensure that the stains have been removed. Drying clothes can set the stains and make them nearly impossible to remove. If the stain persists, try another pre-soak and wash cycle. If you just have a small stain on one piece of clothing, you can use a small amount of Borax and water to do a “mini-soak” before you wash. Using dedicated spoons for your Borax, mix 1 tablespoon of Borax with 2 tablespoons of water. Wear gloves or use a dedicated spoon to spread the mixture across the garment and on the stain. Let the solution sit on the clothing for 30 minutes. After 30 minutes, simply rinse and then wash as usual. What’s in your laundry detergent? Know exactly what’s inside by using Borax to make your own laundry soap. Our fans are always finding more uses for 20 Mule Team Borax. Check them out on Pinterest.